Whether you're off to a weekend trip or a month-long vacation in a tropical island, you need these NEW essential travel accessories for a smooth and hassle-free experience. 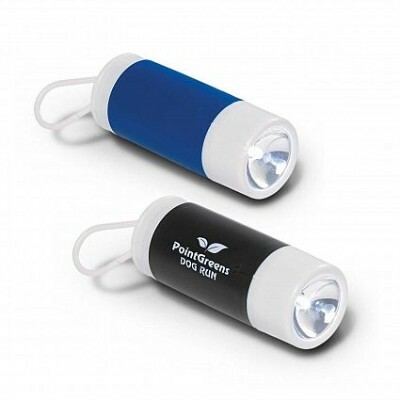 At Vivid Promotions, we have an extensive collection of Promotional Travel Products that will cater to your target market's needs and will take your logo on the road, up in the air or sailing through the sea. The ultimate travel companion. 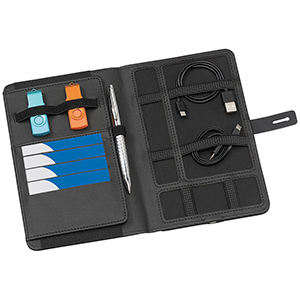 This versatile journal portfolio comes with a built in 4000mAh lithium polymer battery to charge your devices on the go. 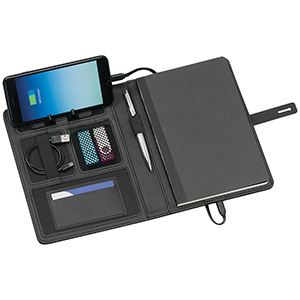 The Power Journal Features: Also supplied with a charging cable to charge most phones and tablets, and battery capacity display and a phone or tablet and a phone or tablet stand. The unit is supplied with a journal pad. Pen & USB's not included. Supplied in a black tuck box. Even on the wettest days still look up to the blue skies with the Cloud pattern on interior canopy. Automatic opening. Dual layer polyester canopy with matching polyester case. Wood handle with wrist strap. Two-section folding metal shaft. Folds up to only 43cm long. The Power Passport Holder Features: Also supplied with a charging cable to charge most phones and tablets, and battery capacity display on the back. Pen & USB's not included. Supplied in a black tuck box. This Cuppia Notebook is Exclusive design black hardcover notebook. The coloured spine and elastic closure add a touch of character which helps to distinguish it from others. Available in 3 colours. 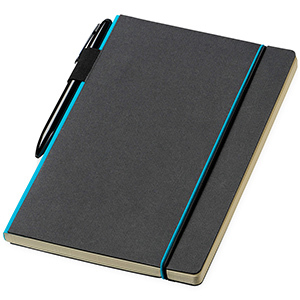 Cuppia Notebook Features: The elasticated pen loop on the spine makes it practical and convenient. Features 80 sheets (80 gsm) of lined paper. Cuppia Notebook Colour: Blue, Grey and Red. The perfect travel companion. 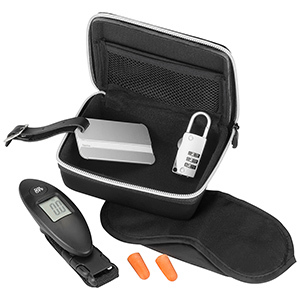 Comes in a durable PVC case with luggage scales, luggage tag, luggage lock, eye mask and ear buds. National Puppy Day seeks to celebrate the unconditional love that puppies bring to people's lives. It is also a day to help save orphaned puppies across the globe and educate people about puppy mills and their many horrors. National Puppy Day is held on March 23rd every year and was founded in 2006 becoming an international celebration and has trended on social media every year since 2012. Want to help raise awareness in hope of improving the lives of puppies everywhere. At the same time promoting your Brand. 15cm of adorable cute fluff. Choose “Leo” the Puppy and see the difference long haired ultra-plush makes. Super soft, high quality plush with plastic details and embroidered feet. Choose from one of eight different shirt colours. 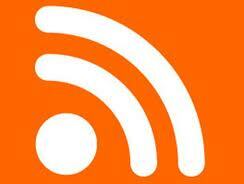 Blue, Yellow, White, Black, Red, Lime, Orange or Purple. Your logo will look good and visible on these Dog Collars 10mm. Made from polyester material, the dog collar is durable, comfortable and suitable with both large and small dogs. It makes an excellent giveaway at dog shows and related events. Screen print your logo on these Dog Collars 10mm for extra brand exposure at an affordable cost. 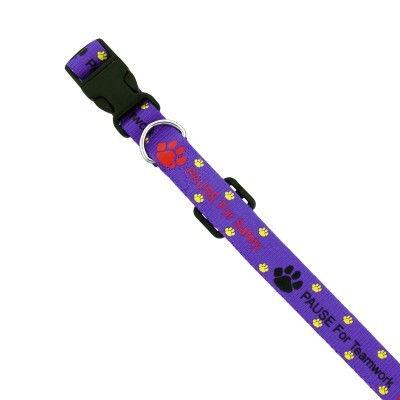 Unleash your promotional potential with custom printed Dog Leashes 10mm. Great for large and small dogs, the polyester dog leash is strong and durable enough for long lasting use. 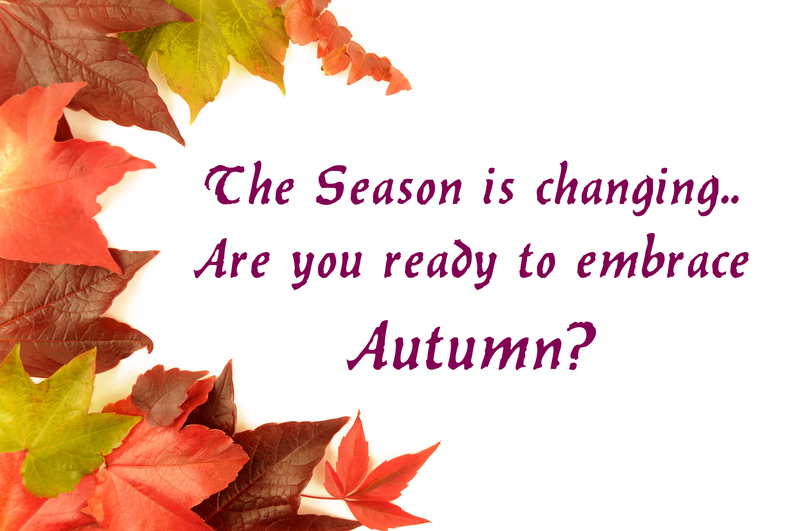 There are plenty of great colours to choose from including red, orange, green and more. 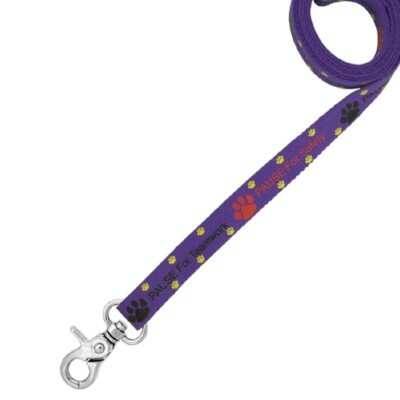 The Dog Leashes 10mm are also available for a screen print logo decoration. 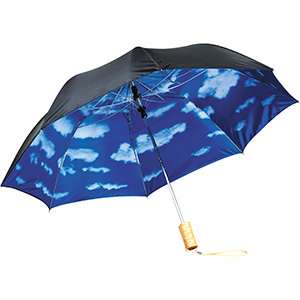 Automatic opening exclusive design umbrella with fibreglass ribs and shaft, packed in a non woven Marksman gift pouch. Available with blue or silver lining. 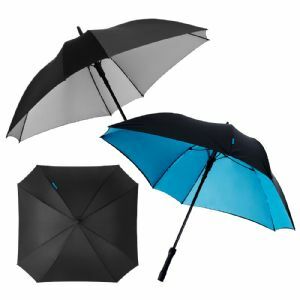 Features: Made from black and blue Pongee polyester material in Black/Blue or Black/Silver. 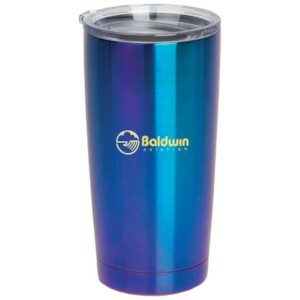 Bring your promotional message on the road with this imprinted KeepCup Brew Medium 12oz. Made from toughened tempered soda lime glass, this handy travel drinkware offers premium quality in a perfect travel size. Also featured is a durable lid off that can be heated to 110 degrees. Can be colour printed with your logo for maximum impact. Usher in more sales and market your brand to more people even on a tight budget using this custom printed Promo Tea Bag Card. 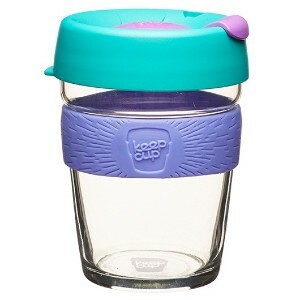 Perfect for people who love their teas, this promotional giveaway will surely fit your plan to a tee. Each tea card contains one single tea bag you can brew at your convenience. 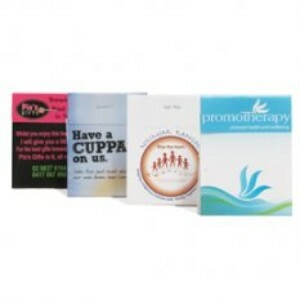 Get practical on your promotions with Pocket Tissues - 10 Pack. 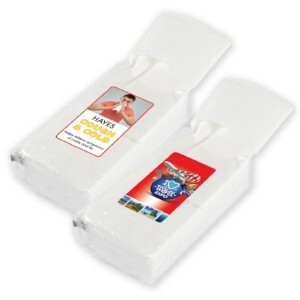 Useful, pocket-sized and inexpensive, promotional tissues are a great way to market your brand. Each pocket sized pack includes 10, 2 layer tissues suitable to use for all ages. The handy packaging also doubles as business card or brochure. It is available for 4CP standard label on front or back. 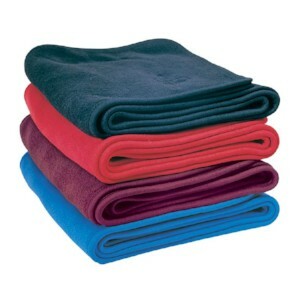 Polar Fleece Scarf is warm and soft, the Fleece Scarf is the ideal addition for any sports team, tour group or school.